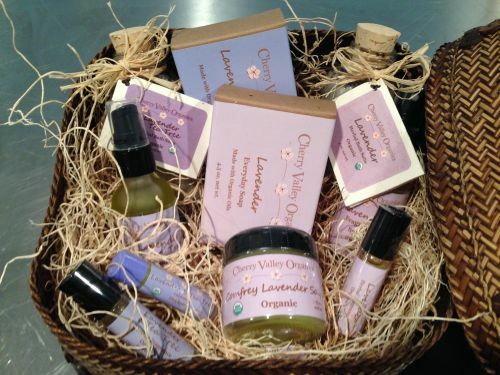 A selection of all of our products in Lavender and Lavender & Tea Tree! It's the perfect gift for that special person in your life that just can't get enough lavender! All of our baskets are socially responsible, fair-trade baskets from SERRV International. The Large Basket includes 1 5 oz. Lavender Everyday Soap, 1 5 oz. Lavender & Tea Tree Everyday Soap, 1 10 oz. Lavender Bath Salts, 1 10 oz. Lavender & Tea Tree Bath Salts, 1 2 oz. Lavender & Tea Tree Massage Oil, 1 2 oz. Lavender Fragrance Spray, 1 1.75 oz. Lavender Comfrey Salve, 1 0.35 oz. Lavender & Tea Tree Roll On, 1 0.35 Lavender Roll On, and 1 0.15 oz. Lavender & Tea Tree Lip Balm. The Medium Basket includes 1 5 oz. Lavender Everyday Soap, 1 5 oz. Lavender & Tea Tree Everyday Soap, 1 10 oz. Lavender Bath Salts, 1 2 oz. Lavender & Tea Tree Massage Oil, 1 2 oz. Lavender Fragrance Spray, 1 1.75 oz. Lavender Comfrey Salve, 1 0.35 oz. Lavender & Tea Tree Roll On, and 1 0.15 oz. Lavender & Tea Tree Lip Balm. The Small Basket includes 1 5 oz. Lavender Everyday Soap, 1 5 oz. Lavender & Tea Tree Everyday Soap, 1 2 oz. Lavender & Tea Tree Massage Oil, 1 2 oz. Lavender Fragrance Spray, 1 0.4 oz. Lavender Comfrey Salve, and 1 0.15 oz. Lavender & Tea Tree Lip Balm.